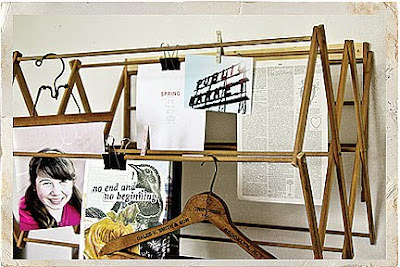 today's project is little something i've been working on for my studio, an inspiration board & photo display made from a vintage drying rack! i came across this totally cute idea while flipping through a magazine a few months ago (please help me if you know which one because i can't remember), and then when i found a vintage drying rack at the retreat vintage market from sweet fellow vendor, hello again, i had to do this! ok, i'll be honest, i had to ask my wonderful husband to help me mount the delicate vintage rack to the wall without destroying it. he added a support bar to the top and secured it to the wall with screws (into studs). and we also trimmed the legs a bit too. 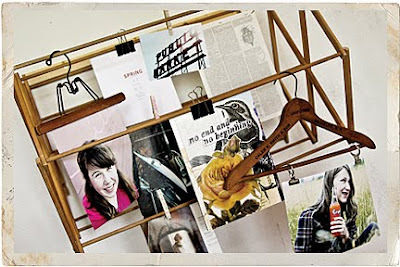 once the vintage rack was hanging from the wall, i started to use it to display photos and other bits of paper inspiration with vintage hangers, extra large clips and clothespins. so fun! 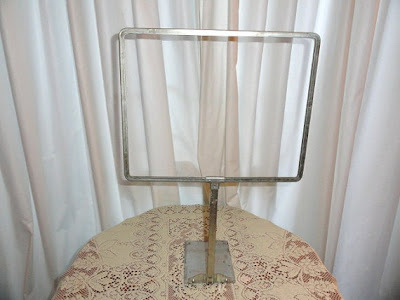 from the amazing world of etsy and bluebonnetfields junk shop, i'm in love with this... vintage sign/display stands make super cute photo holders and you'll be seeing one show up up in my decor projects soon because i'm not just craving this item, i ordered one! -adhere burlap to cardboard and put under some heavy books to dry. 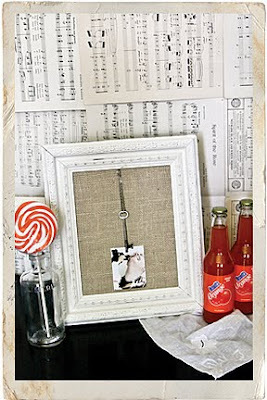 -when burlap-covered cardboard is dry, place inside frame. -hang skeleton key with a pin and place photo inside key (the bottom of key has been repurposed to included a photo holder).